Prime Minister Theresa May will ask MPs to give her more time to secure changes to the controversial part of her Brexit deal – the Northern Irish backstop. Mrs May is due to report back to MPs this week, after trying to persuade the EU to make last-minute changes. According to the BBC’s Iain Watson, the PM will promise Parliament another vote on other Brexit options if a deal is still not ready by the end of February. Labour wants to hold Mrs May to her word and make sure the vote is held. The shadow Brexit secretary, Sir Keir Starmer, has said Labour has drafted an amendment which, if passed this week, would guarantee a vote by the end of the month. He accused the prime minister of “running down the clock” so that Parliament will only have a choice between her Brexit deal, and a no-deal exit. But it was rejected by the UK Parliament and if it is not approved by Brexit day on 29 March, the default position would be a no-deal Brexit. But if no changes are agreed by Wednesday, which is likely, Mrs May will address MPs and say more time is needed. She will then table a “neutral motion” for debate. On Thursday, MPs will debate the motion – and potentially any amendments, such as Labour’s – in a series of parliamentary votes. 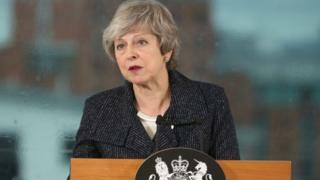 According to the BBC’s political correspondent Iain Watson, some ministers have considered resigning so they could support backbench proposals to force Mrs May to delay Brexit. However Downing Street’s message to them is not to do anything hasty, he said. To reassure them, Downing Street is promising that if there is still no deal by 27 February, MPs will have another opportunity to table amendments setting out alternative options. These options could include extending article 50 to allow more time to reach an agreement with Brussels. Labour’s Sir Keir Starmer has told the Sunday Times that Labour plans to force another vote on her deal anyway. He accused the prime minister of “pretending to make progress” over issues such as the Irish border. Meanwhile, former Prime Minister Tony Blair – who wanted the UK to stay in the EU – has told Sky News that a no-deal exit could be “devastating” for Northern Ireland’s peace process. He told the Sophy Ridge on Sunday programme that it would lead to a “very hard border” on the island of Ireland and is contrary to the Good Friday Agreement, the peace deal he helped negotiate which brought an end to The Troubles.